It’s my mommy’s and my brother’s birthday this month! I decided to make them a yummy treat! 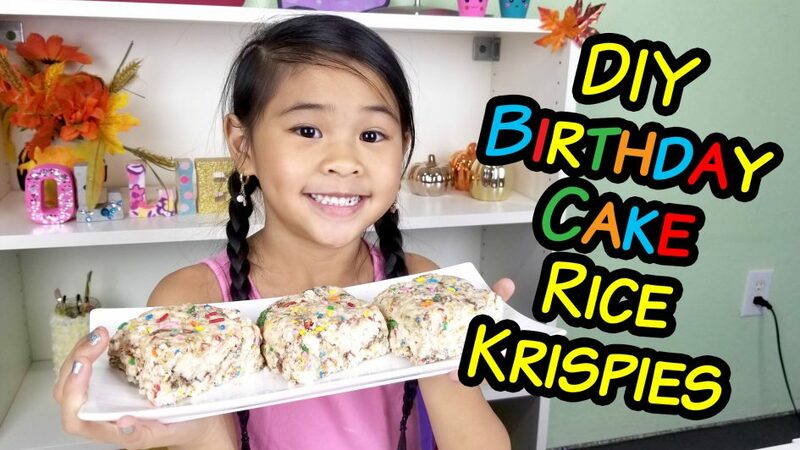 I came up with these DIY Birthday Cake Rice Krispies that are super yummy! They taste just like birthday cake. This recipe is also a lot safer to make since we are melting white chocolate instead of marshmallows which can burn you really, really bad! Be sure to use a non-stick baking tray, parchment paper, or grease up your tray really well or else it will stick to the tray and you won’t be able to get it out. Let me know what you think of my Birthday Cake Flavored Rice Krispie Treats in the comments below!! Also, to celebrate the birthdays and me getting to 3000 subsribers, I decided to do another giveaway!!! It’s a Super Duper Awesome DIY Pack! Watch the video below to see what’s inside and the instructions on how to enter! Okay, let’s get started! First, pour the white chocolate into your mixing bowl. Microwave until it’s melted. Next add the vanilla extract and frosting to your bowl of white chocolate. Mix it well and fast! Then add the Rice Krispies, mini marshmallows, and M&Ms to your bowl. Mix this really well! Pour the mixture into your greased/lined baking tray. Sprinkle your rainbow sprinkles on top and press down your mixture. Let it fully cool. That’s it! When it’s cooled, cut your treats into little squares and serve! You must do all 3 steps to enter! You can also get additional entries by completing the activities below! DIYwithOllie Super DIY Pack Giveaway!